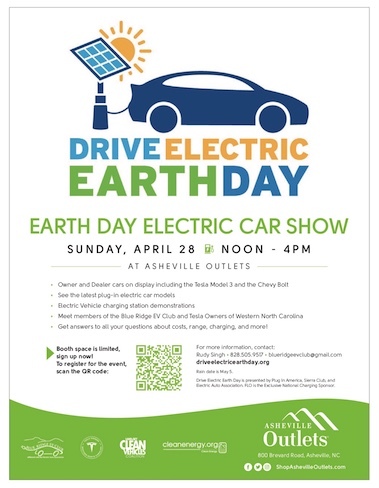 Sponsored by the Blue Ridge EV Club, Western Carolina Tesla Owners and the Asheville Outlets, come and experience the exciting world of Electric Vehicles on Asheville's First Drive Electric Earth Day, April 28th noon to 4pm. Lake Powhatan Recreational Area and Campground. There are currently 109 attendees registered. Registered attendees report 750,400 electric miles driven.